Naming himself Richard Kite, he spends the next ten months desperately trying to find out who he is. But despite media appeals and the efforts of the police, no one knows him. Richard's last hope may be private investigator David Raker - but Raker has more questions than answers. Who is Richard Kite? Why does no one know him? And what links him to the body of a woman found beside on a London railway line two years ago? 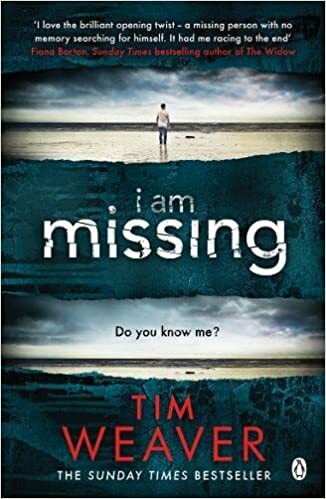 I really did like the opening of “I Am Missing” by Tim Weaver, the 8th in the David Raker series. I have read all but one of them (and that is on the bookshelf!). Writing about people who go missing has proved a good formula so far however the change here is that Raker is “looking” for someone who is in front of him when he Is asked to take on the investigation. The man – currently called Richard – has “lost” his life as he is suffering from dissociative amnesia. Despite an extensive media campaign and police investigations he does not know who he is. Not for the first time the investigation leads Raker into some danger. There are twists and turns almost from the start as he tries to find out anything at all he can about Richard’s past. Excellent writing means that the settings for the story are effective and often bleakly moody particularly in the latter part of the book. I found the characters drawn out in this story generally credible, good and often excellent. Tim Weaver’s writing is so good it makes reading both simple and compelling. The last 25% or so of the book very hard indeed to put down. To be clear I am a real fan of Tim Weaver’s writing. I think he is one of the best thriller writers in the UK currently. This story has a feel of some of the older Raker books at times. For me there were some parts of this that were not quite as gripping as others. However the standard set by Tim Weaver is so high that I found this a highly enjoyable tense thriller all the same. I’d suggest reading then in order if you are new to these (although the first book I found less good than subsequent ones) in part to get the background however mostly because they are extremely good stories. If you are already a fan you will want to read this and I’m fairly sure you will enjoy it.